Dr Blaikie coordinated an inaugural meeting of the TEON Research Group. The meeting took place in March 2017 at the International Centre for Eye Health at the London School of Hygiene and Tropical Medicine in London. The team decided on a program of implementation work on TEON for the next 5 years. 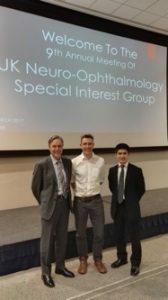 As part of the process of raising awareness of TEON Dr Blaikie presented the current pathological hypothesis of the disease at the National Neuro-ophthalmology Meeting in York in March.